Play with a bonus here! 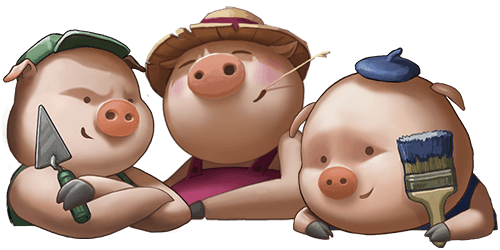 Based on the fable of The Three Little Pigs and of course, the Big Bad Wolf himself, Quickspin’s online slot is potentially one of the most successful games in their portfolio. Brimming with superb graphics and even better bonus features, this game will have you squealing with delight. With bets starting from as little as €0.25, this slot game has a RTP of 97.31% so your chances of winning big is up for grabs. Play online slot The Big Bad Wolf for free right here and when you’re ready to play for real money, take advantage of one of our exclusive free spins bonuses at Guts casino and SirJackpot! One of the most aesthetically-pleasing online slots on offer by Quickspin, the Big Bad Wolf benefits from extra wilds, free spins aplenty and swooping reels adding a very surprising yet delightful element to the game. Based on the renowned fable, symbols include the famous dungaree-clad pigs, a devious-looking wolf as well as the usual regular symbols found in most online slots. Set within a straw house background, rest assured that there is no need to fear the wolf in this game, as he has a few tricks up his sleeve that will benefit you greatly. Payout percentage: The RTP of Big Bad Wolf is 97.34%. Video Slot build: 5 reels, 3 rows and 25 fixed bet lines. Game features: Swooping Reels functionality, Pigs Turn Wild feature and Free Spins with the Blowing Down the House Feature. The Big Bad Wolf is the first online slot from Quickspin’s portfolio that uses the Swooping Reels feature. This ‘cascading reels’ feature gives you the opportunity to win time and time again from a single spin. After each successful spin, the winning symbols are removed to be replaced by others falling directly from above. This keeps going on until there are no more winning combinations. This slot game has plenty of features to satiate the more adventurous of punters. 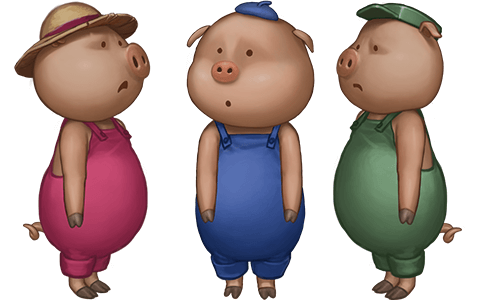 You can expect the big wins to flow during the free spins round thanks to the Pigs Gone Wild symbols. Read on to learn more about the special features on offer here. What makes this game stand out is the Swooping Reels feature activated by all wining combinations. Once you have achieved a winning combination, the winning symbols disappear, to be replaced by new symbols cascading from above. This keeps going until there are no new winning combinations. This feature adds an extra benefit to the game since it will increase your winnings without costing you any money. And if that wasn’t enough. All pig symbols stay wild throughout until there are no new winning combinations. The free spins feature kicks the gaming experience up a notch. This is no ordinary free spins round however. Land three or more Wolf scatter symbols to activate 10 free spins. Land an additional three or more Wolf symbols during this free spins round and receive an additional 10 free spins. That’s a total of 20 whopping free spins up for grabs.The extra free spins are rewarded during the Blowing Down the House feature. 6 moons will blow down the brick house and also give you two additional free spins. A 2x multiplier is applied to all wins. 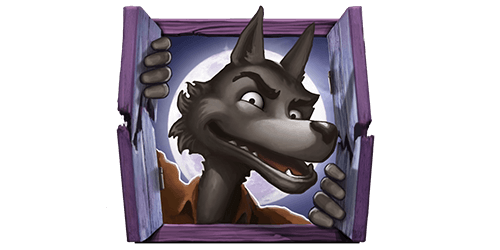 The minimum betting amount on Big Bad Wolf is €0.25 while the maximum betting amount is €125 per spin. The maximum win you can achieve on Big Bad Wolf is worth 1,268x your total stake. Big Bad Wolf is a mobile slot that you can play on the go on either your smartphone or tablet. You can enjoy the same bonuses and features as enjoyed on the desktop version but on your mobile phone. Playing on the go also comes with special benefits. Not only does it give you more freedom to enjoy your favourite game anywhere, anytime but some online casinos also offer special welcome packages for mobile game players. Check out our latest welcome packages, available exclusively to Quickspin Casinos.